- This Premium Chef Universal Knife Block (without knives) by Kitchen Seven is here to offer a seventh-heaven kitchen experience designed especially for you. - Made of high-quality stainless steel, your new universal knife holder will organize up to a dozen kitchen knives of every type and brand. You'll find it just the perfect knife holder block for chef knives, bread knives, steak knives, carving knives, vegetable knives, and any other knife you can think of. Set far back on the counter, it will keep those gleaming, fascinating kitchen cutters out of the reach - and view - of children. - Featuring a double-layer wavy grooved design, it will hold each knife firmly without scratching the blade. Knives will stay as sharp as ever - and clean, to boot. The hollow center, bottom drain hole, and lift-off top prevent build-up of water and dirt, keeping knives clean in a bacteria-resistant, hygienic product that's a cinch to maintain. - The clean, modern look of stainless steel will complement any décor. The smart round design is as practical as it is aesthetic, saving precious counter and drawer space in your kitchen. - So hurry up and place your order NOW for a risk-free purchase that won't fail to please. Give as a gift to friends and family for wedding, housewarming, hostess, or chef school graduation - or to yourself, just because! Kitchen Seven stainless steel knife holders (without knives) - a must-have accessory that's sure to leave you wondering how you ever managed before! 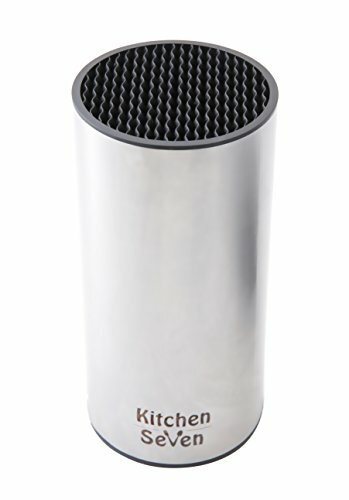 SUPERIOR STAINLESS STEEL UNIVERSAL KNIFE BLOCK WILL STORE AND ORGANIZE - up to 12 knives of any kitchen knife collection safely and securely. Measuring 9" high and 4.7" in diameter, it will fit all types and brands of knives with blades up to 8.6" long. Ideal for chef knives, steak knives, carving knives, paring knives, bread knives, utility knives, and more. PREMIUM QUALITY STAINLESS STEEL CONSTRUCTION - makes for a durable, easy-care universal knife stand that won't let you down! The double-layer wavy grooved top of flexible plastic holds knives securely yet is nonabrasive, reliably preserving the sharpness and quality of the blades. Simply lift off the top for easy cleaning. A small drainage hole at the bottom prevents water and dirt build-up, creating a bacteria-resistant, long lasting product that's a breeze to keep clean. SMART SPACE-SAVING CYCLINDER KNIFE BLOCK - features a functional, pleasing round design. Saves precious counter space during food preparation and leaves extra room for kitchen utensils and appliances. And there's no worry of mishap, either; the 1.3 lb. weight lends stability and prevents unwanted tip-over. APPEALING AESTHETIC DESIGN - will fit any kitchen décor! The elegant stainless steel and attractive cylindrical shape in just the right size combine to create a product with a modern, clean look. Excellent addition to any color or style kitchen, it is a must-have accessory for home kitchens, restaurants, chef schools, hotel kitchens and institutional kitchens. LIFETIME GUARANTEE - assures you of a RISK-FREE PURCHASE; it's your complete satisfaction, or your money back! View More In Knife Blocks & Storage. If you have any questions about this product by Kitchen Seven, contact us by completing and submitting the form below. If you are looking for a specif part number, please include it with your message.